Several spiders common to North America are brown with a yellow stripe down their middle. Orb weavers, western black and brown widow spiders, as well as funnel weavers all have variations of yellow stripes along their backside. 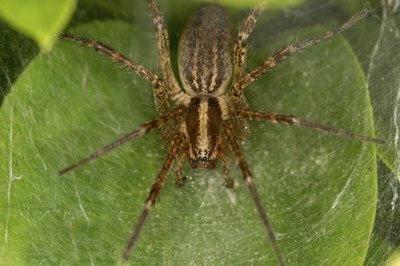 Ranging from venomous to harmless, these creepy, crawly striped arachnids are easy to identify, which can help you avoid potential health risks while gardening and maintaining your home. A common variety of garden spider, there are more than 3,500 different types of orb weavers, most of which have bright stripes and yellow markings. This spider weaves the large, classic spider web you see drawn in many illustrations and used as props in movies. 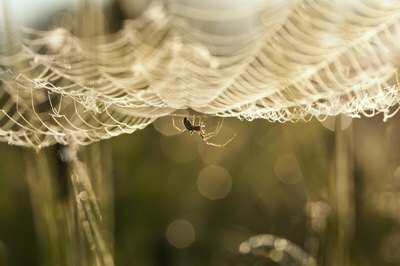 Orb weavers spin their beautiful, radial spirals of silk high up in gardens and fields to catch insects. The spiders have a wide range and are found virtually worldwide. Orb weavers are not dangerous to humans. The male western black widow has a yellow strip on its back. This venomous spider is not aggressive and rarely bites humans. You are not likely to come in contact with male widows, as they like to burrow in dark, undisturbed areas. The males are much smaller than females and have smaller fangs, which may not even be able to pierce human skin. Still, to protect yourself from them, wear gloves and long sleeves when working near large shrubs and animal holes. The western widow's range is from Canada into south Mexico and is predominant in Colorado, Alberta and Saskatchewan. Brown in color, this little neurotoxin-packing arachnid bears a classic hourglass shape which is yellowish-orange in color and is often mistaken for a stripe. The average female's body is about half an inch long, not including the leg span; in layman's terms, it's huge as spiders go. 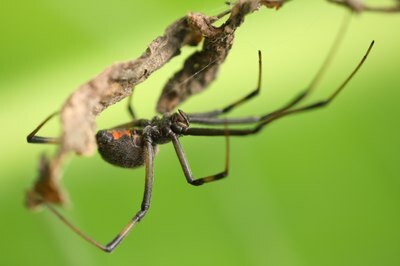 According to the University of California's Statewide Integrated Pest Program, there is only one documented case in America where a bite victim was hospitalized with more severe symptoms than that of a black widow bite. Worldwide in range and mostly found in tropical climates, the brown widow is resident to such U.S. states as Florida, California, Alabama, Mississippi, Georgia, South Carolina and Texas. When working around the house, keep an eye out for brown widows in leaf piles or dark corners of sheds, garages, crawl spaces and basements. You will most likely find them hanging inverted with little white, spiky ball-shaped egg sacs. Funnel weaver spiders are often mistaken for the brown recluse, a highly venomous spider. Dark brown in color and bearing yellow-tan stripes on their back, funnel weavers are not harmful or aggressive. They commonly build their webs in grass but they are also often found in homes. These spiders derive their name from the funnel-like web they build that looks almost like a small burrow. This arachnid ranges throughout Canada and the United States. Keep a look out for the funnel weaver when gardening around shrubs and tall grass. Funnel Weaver Spider: Agelenopsis sp.